Hambo Hoedown has another challenge and this challenge is to use the pencil digi and the colors RED, BLUE and YELLOW. I had a hard time with this challenge for some reason. To check out the Hambo Hoedown challenge go here! How awesome! I love this! It doesn't look like you had a hard time at all - this is a super project. Love the little button! Thanks for joining us at the Hoedown this week! Monica and Judy, thank you for your kind words! I appreciate it! 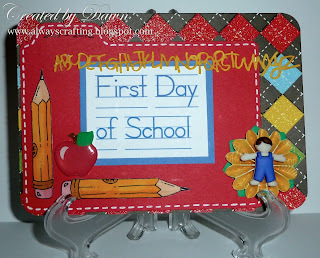 This is adorable and will make a great accent to a scrapbook layout! I. Love the file folder cut out and placement of your apple and pencils! Super cute! Thank you for playing in the hoedown!